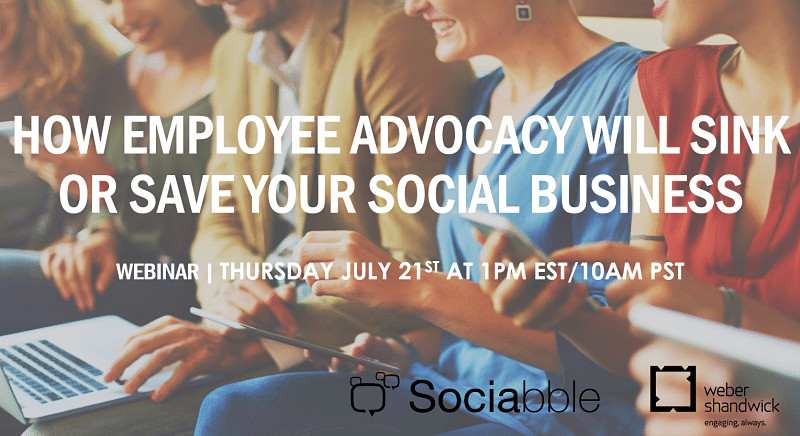 Where does employee advocacy fit into today’s business landscape? Why is it a tool for change? How can it help companies to develop their brand story and nurture long-term engagement? These are just some of the questions that we’ll answer on Thursday July 21st at 1pm EST, when we join Weber Shandwick for a webinar all about employee advocacy and client success stories. The traditional barriers between consumers and brands (in both B2C and B2B contexts) have begun to evaporate; and it’s more important than ever for companies to make themselves available in new ways. During this webinar we will discuss employee advocacy not only as a method of content amplification; but also as a catalyst for change within the enterprise. We will look in particular detail at the power of employee advocacy at scale, both externally and internally. Beyond outward KPIs such as increased reach, audience engagement and lead generation, the potential for internal change is tremendous. More and more companies are harnessing the power of employee advocates as a way to drive digital transformation; and ready all departments for the future of social business. We will examine this by diving into concrete case studies covering initiatives launched by some of the world’s biggest brands. During this webinar we will be joined by Leslie Gaines-Ross, Chief Reputation Strategist at Weber Shandwick, Liz McCarthy, VP Employee Engagement and Change Management at Weber Shandwick, and Simone Schuurer, International Content Marketing / Social Media Manager Microsoft, Bing Ads. Can’t Make It? Want More? If you can’t make the webinar or are interested in other similar content, we have a selection of resources just for you. Check out our webcast with Microsoft on launching global employee advocacy, our keynote session at CeBIT 2016, and this video on why employee advocacy is key to social selling success.